Jamie Carragher thinks Daniel Sturridge has regressed since the days of playing alongside Luis Suarez at Liverpool. Liverpool striker Daniel Sturridge is missing Suarez. 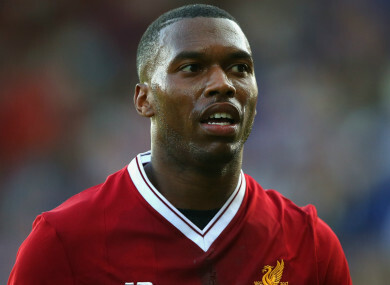 DANIEL STURRIDGE HAS never been the same player since Luis Suarez left Liverpool for Barcelona, according to former defender Jamie Carragher. The England striker started Sunday’s 1-1 Premier League draw with Newcastle United but produced a disappointing performance as Jurgen Klopp’s side failed to win for the sixth time in their last seven matches in all competitions. Sturridge has only scored once this season and managed just three league goals in 2016-17, with injury problems having curtailed his impact in the last three seasons. The 28-year-old scored 22 times in 29 league games in 2013-14 alongside Raheem Sterling and Suarez in a ruthless Liverpool attack, but he has never regained that level of consistency. And Carragher believes Sturridge has regressed since Suarez was sold to Barca in July 2014. “Because he doesn’t play much now, whenever we talk about Sturridge we keep going back to that season when Liverpool nearly won the league – he was devastating with Luis Suarez,” he told Sky Sports. “I don’t think that player is there now, whether that’s due to injuries or not playing enough. Email “Sturridge not the same since Suarez left Liverpool, claims Carragher”. Feedback on “Sturridge not the same since Suarez left Liverpool, claims Carragher”.